He should have never been admitted to seminary. He should have never been ordained a priest. He should have never been in contact with boys and young men. He should have never been called to be a bishop. He should have never been made Archbishop of the capital of the most powerful nation in the world. He should have never been made a Cardinal of the Holy Roman Church. He should have never been allowed inside or anywhere near a Conclave for the election of a new Roman Pontiff. 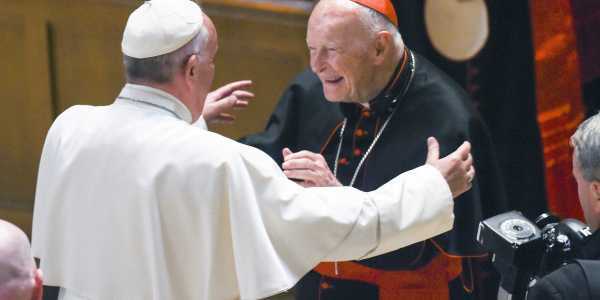 Theodore McCarrick has been removed, too late, from the College of Cardinals, by a decision of Pope Francis prompted by a "letter of resignation" that McCarrick was certainly "advised" to send before being kicked out. He was also barred from the exercise of any public ministry. "Uncle Ted", as he asked the boys, young men, and priests he abused to call him, is unfortunately not alone. His is just the latest in a long line of homosexual predators who dominated for decades the U.S. Church, and who have had the upper hand again in the nation's hierarchy since the election, with McCarrick's help, of Cardinal Bergoglio as Pope. This has all come too late: there is no sense of justice. And much perversion is still under cover in scores of chanceries all over America. And, even worse, all this perversion is fully known to bishops around the country and around the world who are not only complicit in the abuse machine, but, as McCarrick, are themselves members of this clan. May God have mercy upon His Church: may He punish severely the perverted hierarchs still clinging to their positions.